Barnet UNISO N are concerned about the proposed closure of two of the four Job Centres in the Borough. The DWP appears to have not fully considered the impact this would have on those people working in and using Job Centres, and the wider community including our members working to provide support for those seeking work. Reducing the number of Job Centres will place greater strains and stresses on people who already are in the difficult and worrying situation of having to find work as travel costs and waiting times will increase. The closure of half of the Borough’s Job Centres will put further pressure on our members working in council services such as libraries and social care who are providing support to people who are out of work; our members are already suffering from additional pressures from cuts to jobs and resources. Barnet UNISON call for a more imaginative and socially responsible approach to providing Job Centre Services in our Borough. This to be arrived at after a full and real consultation with Job Centre workers as represented by the PCS, service users, the Council and other concerned organisations. 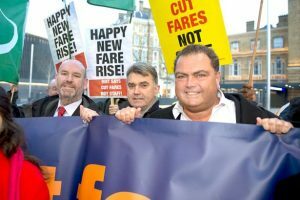 Barnet Unison – Local Government branch. In recent years, London has seen a number of estates undergo ‘regeneration’. Many of these have resulted in demolition, the loss of much needed social homes, and the displacement of communities. 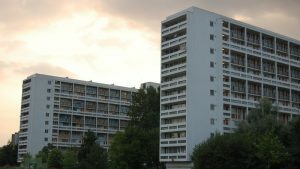 Sadiq Khan has released a ‘Draft Good Practice Guide to Estate Regeneration’, but as it stands none of the most important safeguards are enshrined. It should be a basic democratic right that people living on estates facing regeneration should get to have a vote on the different plans. We call on Sadiq Khan to require that regeneration takes place ONLY when there is resident support. Councils must BALLOT their residents, ensuring everyone gets a VOTE in the future of their home. As the mayor promised in his manifesto, regeneration should only go ahead with majority resident support. We the undersigned, from across North London (namely the boroughs of Barnet, Camden, Enfield, Haringey and Islington), write to express our opposition to US President Donald Trump being accorded a state visit to this country. 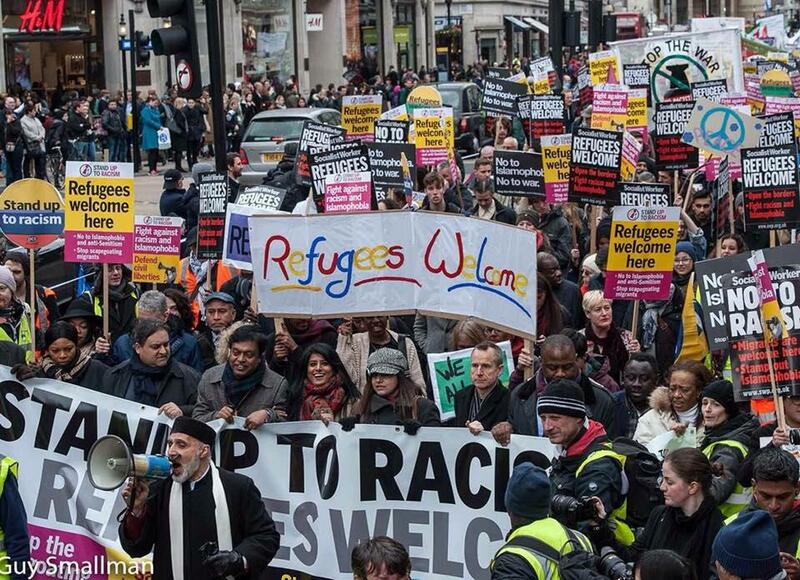 Racism, sexism, misogyny, Islamophobia, antisemitism, homophobia, war mongering, climate change denial or policies designed to boost the wealth of the already super-rich should not be rewarded or celebrated – most people here want no part of it. They do not expect our government to condone or celebrate such policies or the values that stand behind them. Trump is, as the president of the richest and most powerful nation on earth, uniquely placed to do good or ill. His tenure in office so far shows beyond doubt that he intends the latter. 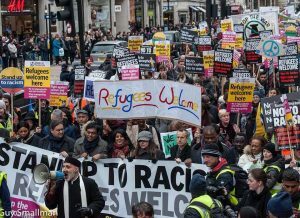 We call on elected representatives, local councils and all sections of society from across North London to express their opposition to him being accorded a state visit, and we pledge to join those who will protest against Trump’ state visit. Are you struggling with housing costs in London and want to tell your story in the media? Next month a major piece of research will be published, looking at the high cost of living in London, particularly for households on modest incomes. We want to make sure that the message is heard loud and clear that rising rents are a major problem for a large group of Londoners across the city. Perhaps you’ve been forced to move because the landlord has put up the rent, or the gap between your wages and housing costs means you’ve had to put up with unsuitable homes, or just found it harder and harder to find anywhere to live in the city. If you would be interested in speaking to the media about your experiences, please reply to sebklier@generationrent.org by Friday 3 March, giving a little bit of information about the problems you’ve faced as a result of London’s high housing costs. Please do pass this on to anyone else you think might also be interested. Thanks – together we can make the case for housing in London that is properly affordable for all the city’s residents. You are cordially invited to a meeting on “Air Pollution and what we can do about it” on March 23rd 8 pm, at St John the Baptist Church , Barnet High St EN5 4BW. Each will give a short talk and afterwards there will be a Q & A session. Buses: 107, 307, 84, 263, 326, 34, 134. Reproduced from John Burgess’ blog. Yesterday, I registered a hate crime directed at me. I registered the hate crime because on Thursday 9 February, 2017 I received an unsolicited email from someone I do not know and who claimed to be supporting me. It is a sickening email. I have shared it with some close friends. Because of the serious nature of the allegations I have responded back to the sender asking for their contact details so that I can speak with them. In my opinion if the allegations were true there would be serious ramifications for the trade union movement. Any reasonable person after receiving such a shocking email and having been unable to elicit a response from the sender could only come to one conclusion; that the sender was attempting to bully and intimidate me into silence. Firstly, I want to reassure my friends that I am ok. If I had received this email a year ago I am not sure how I would have responded and it could have been very serious. But I have been back at work for over five months. Life is never straightforward in Barnet, so I am having to operate with all the energy I have to keep my focus which is always to my members and the community we serve. I sought the opinions of some close friends and the consensus was that the purpose of the email was to try and destabilise me, silence me and undermine my mental health so that I do not trust my comrades. However, the sender and or the others behind this attack fail to recognise that I belong to a tight community and I also have friends outside of Barnet. I am also an organiser. It is in my blood and when someone picks on someone I can’t look away. I am not a spectator, I have to offer my help and dealing with bullies has for me been a fight that never goes away, no matter what it means to me personally. Well, I thought about what I should do. “Ignore it”, was a common response. But, what about the others the sender also bullies, how can I just let this go? I quickly decided I can’t and so I decided the first step was to register it as a hate crime with the police. I have provided the police with the email and the email address. I have tried to find the identity by looking up the IP address which led me to an address in California, it is an @icloud.com email address. However, if you know someone who knows how to trace an email please let me know. I don’t believe such a meeting took place. As I said earlier this was an attempt to try and bully someone who is known to have had a serious mental health breakdown. Now it is true that I made a decision to go public about my own battle with my mental health, which I didn’t take lightly but I felt that it was one thing to tell others to share their experiences and another to keep mine to myself. It was scary decision, but I have had nothing but positive feedback from hundreds of people, some I know, our members and others who have just read some of my blog posts about my mental health issues. This is not the first time I have been subject to threats and probably won’t be my last. I also had threatening emails and smears whilst I stood as a candidate in the UNISON General Secretary elections. I have been the target of two hate crimes which resulted in damage to my car, one of the attacks took place less than 5 metres from my front door. Back then I took a decision to go public, to say I would not be intimidated or bullied into silence. My message to the sender. 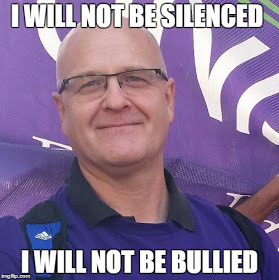 I will not be silenced I will not be bullied, I will not allow you to push me into the shadows. I will not be backing down from standing up for what I believe in. Whatever you thought you would achieve by sending that email has back-fired. This matter is not at an end, it is only just beginning. 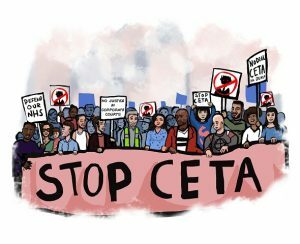 Let’s stop CETA before it’s too late! Please note that the Labour MEPs will be voting on the 14 of Febuary on whether to support oir not, and not on Feb 6th, as we had previously been informed. So that gives us more time to do something against CETA! For example a quick phone call to your MEP. Click here to make a quick, free call to Members of the European Parliament. I’m sure you appreciate the significance of CETA by now, so here’s the last useful action you can take. It will only take a few minutes, but might change your future drastically! It is now 99% likely that the final vote to start Provisional Application of CETA will be on February 15th. The Socialist and Democrat block (S&Ds) are wavering, and are going to vote on their agreed position next Monday, February 14th. We need to lobby those that are still persuadable. The Provisional Application will cover 90% of CETA, but will not initially include the controversial Investor Court System ICS. Our government is very keen to see CETA fully applied, with ICS, as a blueprint for all future trade deals outside the EU. (Without the protection of the European Court of Justice as well of course ! ). It will be possible for the government to fully implement CETA, with ICS, by putting a notice in the House of Commons Library for a period of 18 days. This will mean all public services (the NHS and education ) are included from now on, by default. If you could also resend this to any Labour party or Trade Union contacts, that would be great! After all, we only have until Monday at the latest!